How to hide red div when clicked to blue div? I've had a little play and reckon I've come up with something that solves this issue for the original provided code. PageX is the horizontal co-ordinate of the cursor. X is the co-ordinate of the left-hand edge of the blue box. 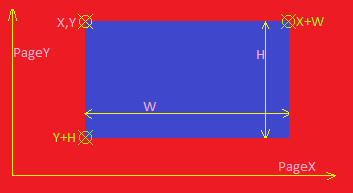 W is the width of the blue box. Therefore we can work out the right-hand edge of the blue box by simple addition: X+W. The same logic can be applied on the vertical co-ordinates (top=Y, bottom=Y+H). The if statement in our JQuery above checks if PageX falls between the left and right-hand edges of the blue box and that PageY is between the top and bottom. i.e. is the cursor in the blue box! Floating elements within a div, floats outside of div. Why?